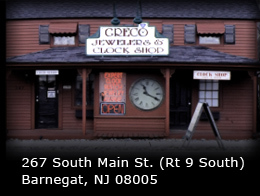 For over 40 years, Greco Jewelers has been accessorizing the Jersey shore region at very affordable prices. Greco Jewelers carries the finest in New and Estate Jewelry, Watches & Clocks. 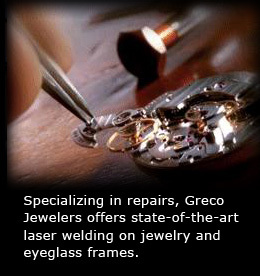 Specializing in repairs, Greco Jewelers offers state-of-the-art laser welding on jewelry and eyeglass frames. House Calls can be made on grandfather clocks. Greco Jewelers buys: Gold, Silver, Watches, Clocks & Antiques. Appraisals on all clocks, watches and jewelry.